I feel like sticking my body in the fridge. It's time to ditch those thick winter lotions for lighter, fresher and cooler ones. And don't forget to apply sunblock after your lotion! I love Vaseline's Aloe Vera gel lotion. Its perfect for summer. Very light weight and moisturizing at the same time. cynthia! i love vaseline lotions!!! i have the blue one and the pink one. I have the healthy white lotion with me. It is nice. @GGG~ I love Vaseline too!!! Hey Cynthia! This time when I was in India, I could already feel the summer heat heating up my whole head, I reckon Delhi is going to be a furnace in the months of may, june and july. thanks for this guide .. I was thinkin of getting some light body moisturisers for summers .. yu make everythin so easy !! 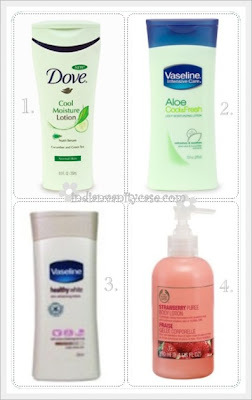 The Dove Cucumber and Green Tea lotion sounds really really good. I've never tried this variant before. I'll check for it the next time I'm at the store. :) Stay cool, Cynthia. I don't think I can survive an Indian summer myself! Choosing a body lotion for me is important because I love when my skin feels youthful and soft to the touch. I have used the Aloe & Jojoba Cream Therapy from Made from Earth for over a year. The fragrance is very light and fresh, very soft. It does not feel sticky or wet and gooey. It absorbs nicely and quickly and makes your skin feel soft very quickly. It does not have any alcohol (its chemical free) because it has never burned my skin, even when I used it after I got a really bad sunburn from laying our by our pool. I have yet to find a small bottle to carry around with me so I poured some into a little bottle a bought. I am that addicted. Hopefully they will either make a small handsized one soon.